Time and again, studies on hedge fund performance indicate that smaller, emerging funds outperform their larger brethren because they are more nimble, being able to get in and out of positions without moving prices; and have the ability to build focused portfolios. Even with this evidence, emerging managers are finding it difficult to raise money. The situation has been exacerbated by Dodd-Frank legislation, causing proprietary traders at banks to spin-off into hedge funds and prohibiting banks from investing in funds. More funds are chasing less investment capital. Also, the HFRI Fund Weighted Composite Index returned negative 4.8% in 2011. Investors want access to the higher returns of emerging managers. 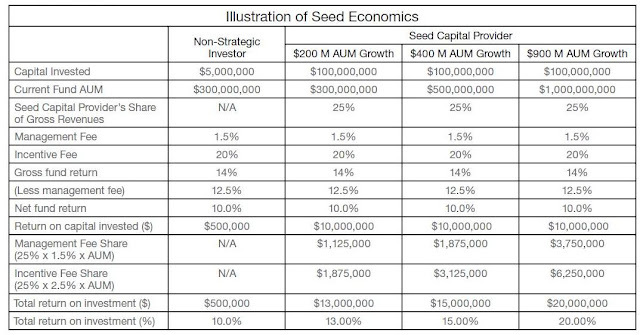 These pressures are causing managers and investors to turn to an alternative: seed capital. According to a research report from Larch Lane Advisors LLC, seed capital is a multi-year commitment in emerging hedge funds. Larch Lane has been a provider of seed capital since its inception in 1999. It has seeded twenty-five hedge funds. Seeders (either from an investor or a hedge fund seeding vehicle) give small funds a stable asset base that will not be withdrawn at the first sign of a drawdown. This helps attract other investors. Fund managers may receive assistance in operations, risk management, marketing and business development. Seeders can receive a share in the fund’s management and performance fees, full transparency, risk control and ability to monetize their investment. The three main seeding arrangements are equity ownership, revenue sharing and hedge fund platform. In equity ownership, the investor actively helps manage the hedge fund from a business point of view only. Investment decisions are still made by the manager. Seeders can profit by being bought out by the manager or another investor or the manager may grow large enough to be brought to the public markets. The Tiger Cubs are the most prominent funds in this category. They were seeded by the famous investor Julian Robertson of Tiger Management. He invested $25 million for a 25% equity stake. The Dutch firm IMQubator is another investor using this type of transaction. In January, they announced a joint venture with Synergy Asset Management to source emerging managers in Asia. In revenue sharing, the arrangements are variable but they all have one goal – to enhance returns. A seeder’s investment is improved by the fund’s revenues. As the fund attracts more assets under management, the seeder’s returns increase. Additionally, the manager pays a percentage of the revenues (usually around 20-25%) to offset the “2 and 20” fees paid by a regular investor. Below is an example of how the return on investment increases as the assets grow. Source: “Hedge Fund Seeding: A Compelling Alternative.” Larch Lane Advisors LLC, 2011. Terms of the agreement between seeder and hedge fund may include a limit on the amount of fees shared with the investor or the investor may pull out its capital after the seeding arrangement is completed and still retain the revenue flows. FRM Capital Advisors has used revenue sharing agreements in seeding funds such as WestSpring Advisors and Beechbrook Capital according to an article in the hedgefund journal. FRM Capital Advisors’ parent is Financial Risk Management, a fund of funds with more than twenty years of experience. Hedge fund platforms are offered by large hedge funds and financial institutions. They provide a platform with marketing and operational expertise. The investor has control over the manager’s business and investment process. A hedge fund seeding vehicle specializes in investing in emerging funds. According to one source, the number of seeders has dropped from 100 to 20-30 in third quarter 2011. They close two to four deals annually and the average size of an investment is $10-30 million. In addition to the advantages of direct investing (share in fund growth, higher return potential, transparency and risk controls), a vehicle gives investors manager diversification, access to co-investment opportunities and returns equivalent to private equity but with better liquidity. The 800 pound gorilla is the Blackstone Group. It raised $2.4 billion for the Strategic Alliance Fund (SAF) II in 2011 according to HFMWeek. Other large firms include Reservoir Capital ($1 billion), Protégé Partners ($750 million) and Goldman Sachs Asset Management ($500 million). Current investing conditions are favorable to the growth of seeding arrangements. They allow investors to participate in the fee structure of managers and the on-going growth of the hedge fund sector. 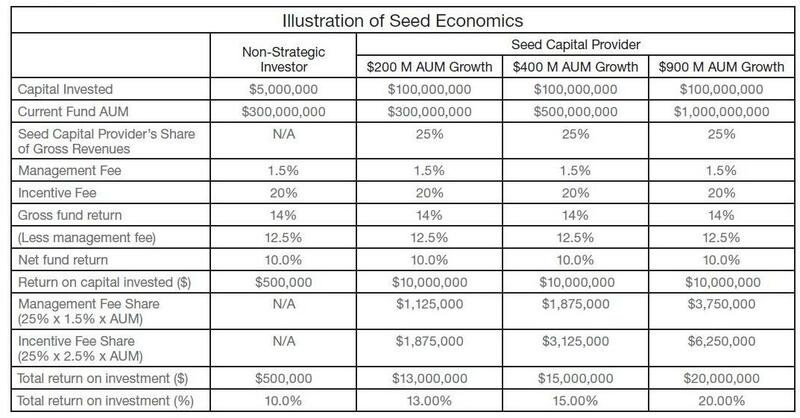 A seeded fund attracts other investors and allows the seeder to benefit greatly by the increase in assets under management. In addition, investors gain exposure to the higher returns of emerging managers. Anyone with a longer time horizon will find this an attractive investment as three years is the standard lockup period. Managing your assets carefully will bring good fortune to you and your business.